Pets In Politics - See 15 cutest Animal Politicians of the World! Pets In Politics – See 15 cutest Animal Politicians of the World! Politics, the word that so often gives humans a bad name. We have all heard of the political gimmicks from buying the god a gift to coming full circle on Jallikattu ban. So dire are the political times today that it only makes sense for our furry friends to replace politicians. Over the course of history, there actually have been animals that have “run” for various political offices (and sometimes even won). 1. 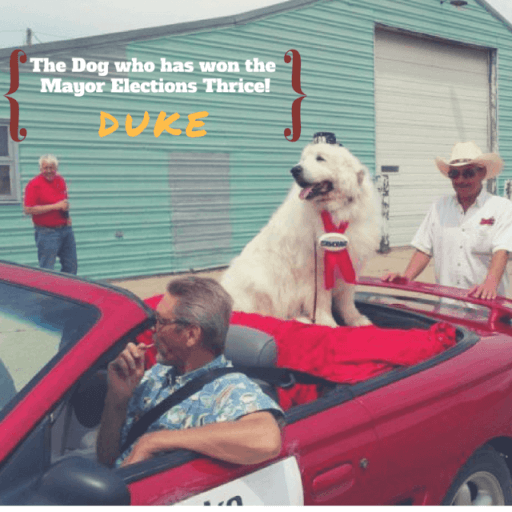 Duke, the dog – three time mayor! 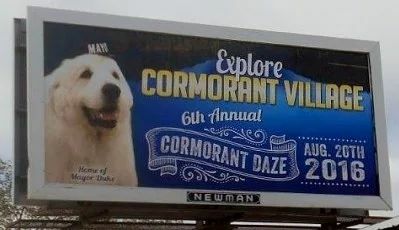 Duke, the nine-year-old dog was re-elected for a historic third term as mayor of Cormorant, a tiny Minnesota town! 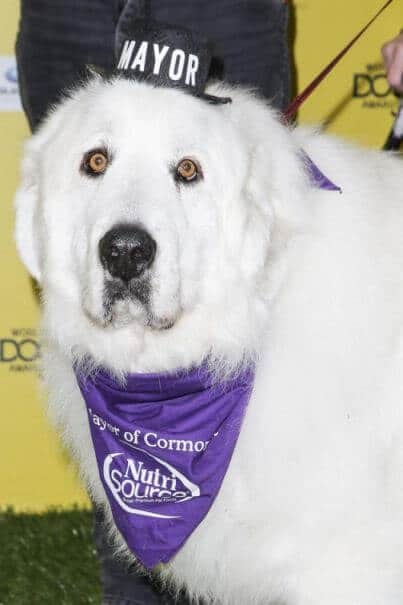 Well, unlike the bitter war for US presidency, no one ran against this dog in the township of 1,000! Duke perhaps would be the world’s most popular politician given his landslide victories! Mayor Duke also features on highway billboards to support tourism and local businesses! 2. Stubbs, the cat – Mayor of an Alaskan village! 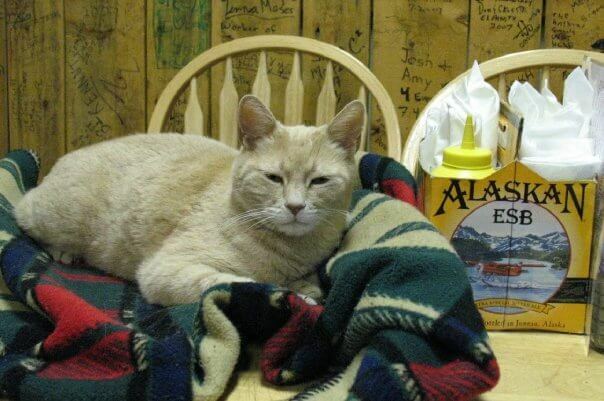 Stubbs, a 17-year old cat has been the Honorary Mayor of Talkeetna, a tiny Alaskan village for the past 15 years! Since 1997, Stubbs has been the top cat, proving to be the town’s most attractive tourist interest. Visitors can see Stubbs every day at the local general store, which doubles as his mayoral office. 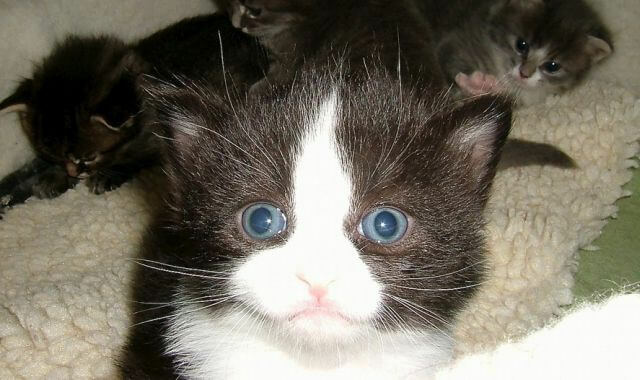 But that’s not all, the ambitious cat also made an unsuccessful run for the senate. 3. 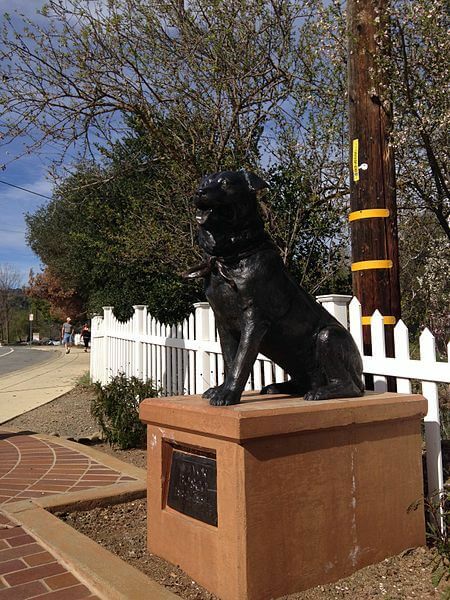 Bosco, the dog was elected honorary mayor of Sunol, California and served for 13 years! Bosco defeated two humans to win the honorary mayoral election in 1981 and served until his death in 1994. Today, a statue commemorates the town’s favorite mayor in front of the post office. 4. Hank, the Cat began a highly popular Senate campaign in 2012 but ended up on the losing side. Hank’s owners Matthew O’Leary and Anthony Roberts wanted to raise awareness and money for animal groups around the country, several of which donated to Hank’s cause. By the end of the election — in which Hank came third (7,300 + votes), he had raised over $60,000 to help animals in need! 5. 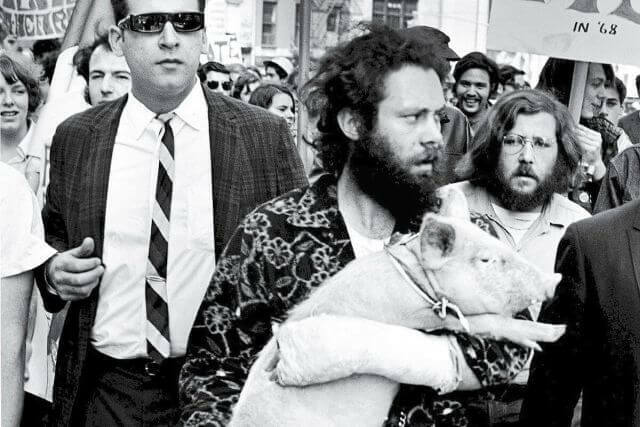 Pigasus, the pig was nominated by Youth International Party (Yippies) to protest the Vietnam War during the 1968 presidential elections. The police arrested Pigasus and seven of his human supporters at a rally to announce Pigasus’ candidacy. 6. Giggles, the pig also had political ambitions as he ran for the mayor of Flint, Michigan. Unfortunately he too didn’t make it to the public office. 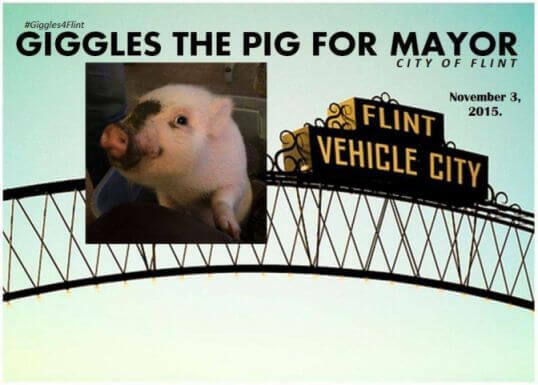 Giggles, the pig ran for the Mayor of Flint. Stan was adopted by a cat-loving writer who formed a political outfit for the welfare of homeless cats in the area. He ran for mayor of Halifax in 2012, when he was three years old but unfortunately lost the polls. Stan might not have won but he is still a local hero! 8. 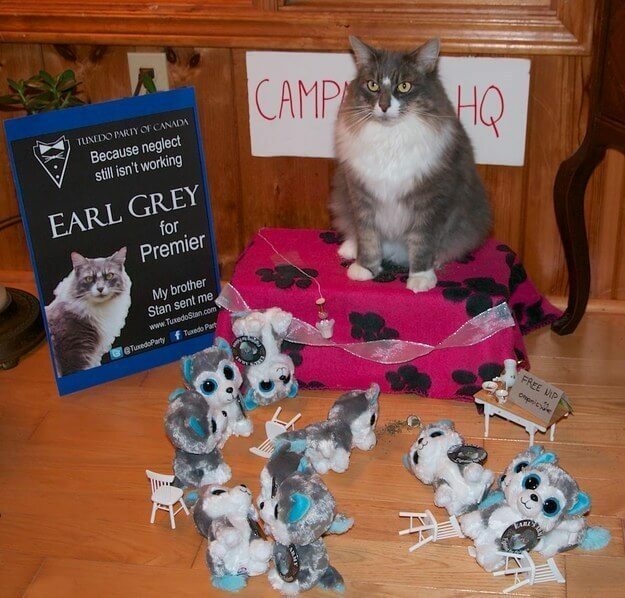 Earl Grey, the cat who contested for Canada’s Prime Minister! She was backed by Stan, the cat but unfortunately she couldn’t win the elections. But as they say cats have nine lives… nine electoral chances, may be? 9. Pa Kettle, the cute doggy mayor of Colorado town Divide. 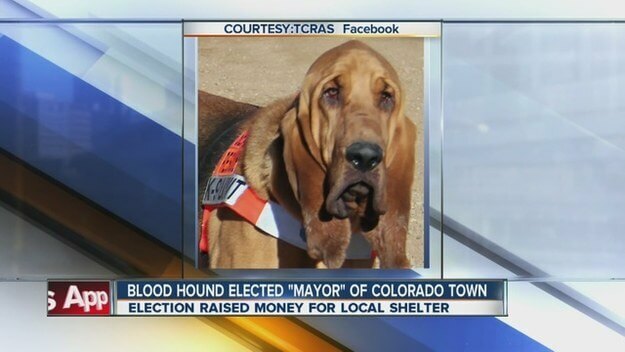 The people of Divide have elected a dog to be their new mayor. But here’s where it gets real interesting – the runner up, who will serve as Vice Mayor, is a wolf named Kenyi and a cat named Buster will serve as the viceroy! 10. 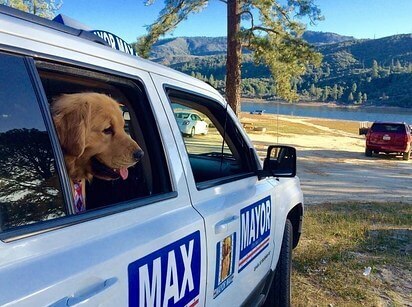 Mayor Max, the cute furry Mayor of Idyllwild, California. For a dog who started his life as a garbage-dwelling stray, Saucisse’s life turned upside down after being rescued by a French writer named Serge Scotto. Scotto brought Saucisse as a character in his novels. This brought the dog a fair amount of fame— leading him to finish finished 6th (with 4.5 percent of votes) when he “ran” for mayor of Marseille in 2001. In 2009 he appeared in Secret Story, the French version of Big Brother. 12. Cacareco, the rhinoceros who became a member of Sao Paulo’s civil society by beating 500+ candidates with over 100,000 votes! Tired of the corrupt politicians, the people of Sao Paulo fielded an incorruptible candidate in form of Cacareco, the rhinoceros. 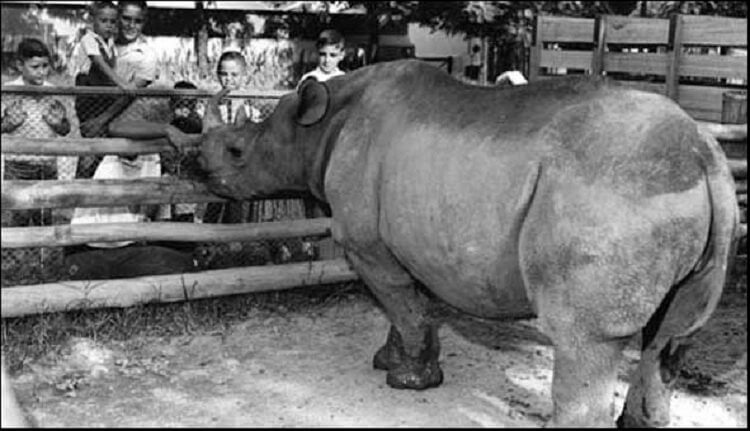 The five-year-old rhinoceros became a symbol of residents’ protest against the corruption of the Brazilian government. 13. 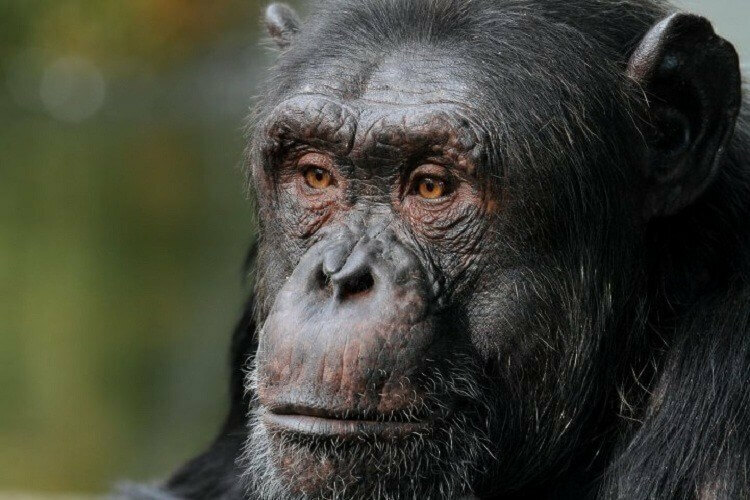 Tião, the chimpanzee who ran for mayor! 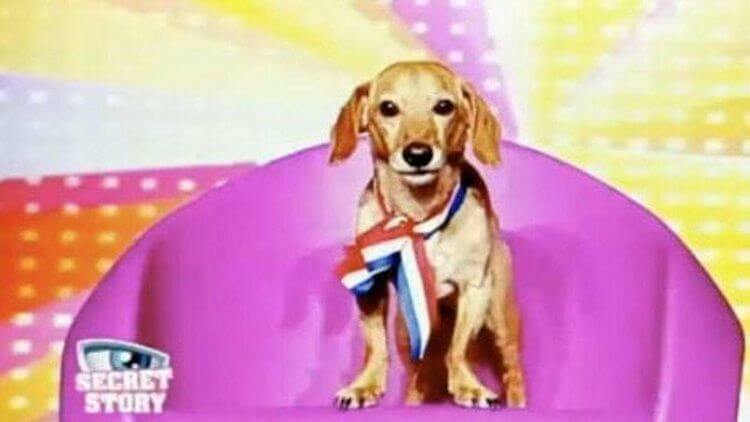 As per unofficial sources, Tião came in third with over 400,000 votes, all of which were annulled. 14. 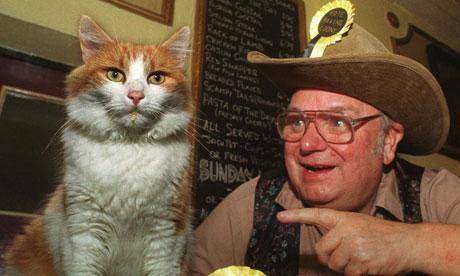 Catmando, the cat served as joint leader of Britain’s Official Monster Raving Loony Party (along with his human Mr. Hope) from 1999 to his untimely demise in a traffic accident in 2002. 15. Billy, the goat and Tai, the poddle – The World’s Best Presidents! The little township of Whangamomona, New Zealand prides in calling itself a republic. They’ve perhaps the most interesting array of Presidents – from Billy Gumboot, the goat who ate all his opposition’s votes to win the 1999 election to Tai, a poodle. Do you think animals would make for better politicians than humans? Posted on January 24, 2017 January 24, 2017 Author Abhishek JoshiCategories Hail the hound! 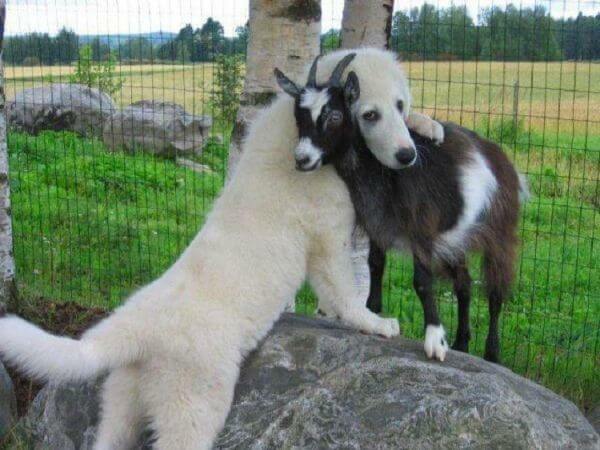 Next Next post: This Heartbroken Dog Visits his Best Friend’s Grave Every Day!